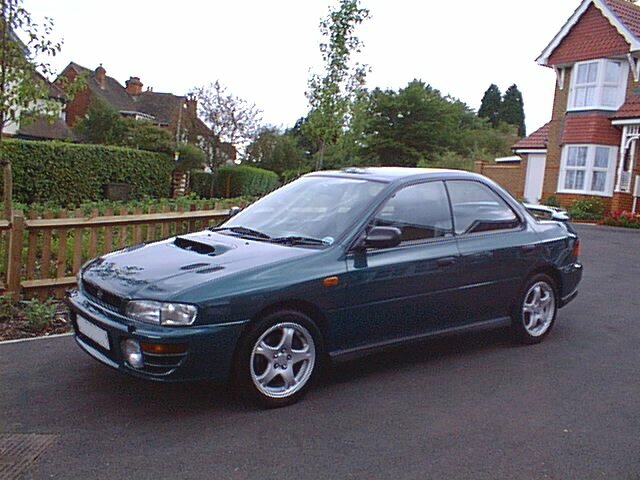 Bought new in August 1998 from Mill Lane Subaru in Basingstoke. As is normal with these cars I had to pay list price for the car. I was lucky to find a new dealer in June 98, so securing a car for August delivery, when most of the other official dealers were quoting 8 months delivery times - if you're lucky. The car has had a few extras from the Subaru options list: Air Conditioning, Cruise Control, Head/Fog lamp covers and carpet mats. Also, I haven't relied on the standard immobiliser as the only anti-theft system. In the first week of ownership the cruise control system jammed, causing a seriously scary moment. Considering the cruise control was fitted specially by Subaru UK rather than the dealer this was a bit disappointing. Subaru have rectified the fault, and as compensation I had a "VIP day" at Prodrive. The cruise control has since had a further upgrade and now works fine. During its life the car has had one or two faults. It was very difficult to engage first gear at crawling speeds, so Subaru replaced the gearbox after a month - no questions asked - amazing service! The replacement was fine. The car also suffered from a common problem with these cars... the turbo wastegate solenoid sensor became contaminated which meant that the car was unable to develop maximum boost for a while. This was again fixed under the warranty, but happened four times, so started to curse... However it did not recur after the start of 2000. Subaru have a reputation for good customer service, and good reliability. They deserve it. The car was fitted with a ScoobySport back box - this really is an absolutely essential modification to these cars! Tyres were changed at 20,000 miles to a set of Bridgestone Potenza S-02 Pole Positions. Awesome. I was obviously a softee because not only had the tyres lasted me 20000 miles, the front brake pads also lasted me 37500 miles! Is this a record? The only other work that has been done to the car relates to in-car entertainment. I installed the same head unit and CD-multiplayer that I had in previous cars. I changed the CD-player to be a six-disc unit bolted to the floor under the front seat. Whilst installing the stereo equipment I also added substantial anti-rattle measures to the dash-board area. Fuel economy averaged around 23mpg, which was pretty much as expected. The car was sold in June 2001 with 44000 miles on the clock.